General Ekstra Sterk: A Super-High Nicotine Winner or will my Heart be Broken Again? When Swedish Match first announced the introduction of General Sterk earlier this year, I was ecstatic! The General Flavor in a Strong Snus! I rushed to my computer to post the good news! Then I started hearing mixed reports on the taste and longevity of taste, especially for a White Portion. And it was named General Sterk, not Stark, meaning it was designed for the Norwegian Market. In my experience, that means a milder tobacco taste, regardless of the nicotine. Sure enough, the original General Sterk was mild and had some other drawbacks I highlighted in my actual review. Not so with the new General Ekstra Sterk (Extra Strong) very high nicotine snus! 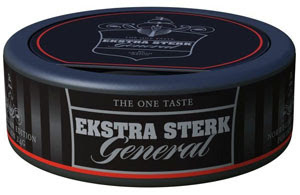 General Extra Strong is available either as Ekstra Sterk portion snus or Ekstra Sterk loose snus. Either way, General Extra Strong Snus is absolutely fantastic! Mr. Unloadingzone, i have not been this excited for a long time! I went directly to buysnus.com after reading your article and bought a few cans of the extra sterk. Did you know that Grovsnus and Roda Lacket both came out with new strong snus's? I bought a few cans of those to try as well. You may not remember me, but I posted several of the longer comments about General Sterk when it first came out, since you had not tried it yet. I hope that this new extra strong General does not turn out like the sterk did. Anyways, I appreciate all the research that you do to keep all of us snusers up to date and I can't wait to visit your new snus website. Keep up the good work! Hi Anonymous Sterk #1 Guy! Of course I remember you! While apparently the Swedish snus users are not fond of Stark snus, according to Swedish Match focus groups, Americans love them! The Grovsnus and Roda Lacket are on my list for the high-nicotine taste test order now thanks to you. I've been so wrapped up with getting the "uber-snus" site live that EVEN I, the Snus Guru himself, Mr. Unloadingzone, completely missed those. That's the real reason I'm doing the Stark/Sterk test right now.....I'm living on Onyx and caffeine! What better time than to sample and re-sample strong snuses? I hope the new Sterk had more changed than just the nicotine count too....but 15 mg.!!!!! Uber-Snus itself is 95% done...the content loading and graphics are taking some time....plus a little surprise I haven't mentioned at all. Soon, though, SOON! I'm biting my tongue because there is something I would like to tell you about Stark snus....but am sworn to secrecy. It's good news though! Welcome back. If you get your order before mine, let me know your thoughts on the Ekstra. This is Sterk # 1 Guy again. I recieved my shipment from buysnus yesterday. I couldn't wait, so I opened the Ekstra Sterk right away. This is definately a strong snus! It tastes just like the General original portion, with all of the characteristic flavors, plus a nicotine kick. I was a little worried when I first looked at the can because it said "Norwegian Edition" just like the Sterk white portion. I was pleasantly surprised. It is classic General with more nicotine. I have not been able to get to the Grovsnus Black or the Roda Lacket Claq Qui yet. The Ekstra Sterk was not a let down. Thank goodness! I hope that you enjoy it, I have a feeling that you will. I have been scratching my head over what you said about wanting to tell me something about stark snus. As long as it is good news, I am content being in the dark on that. Let me know what you think when your shipment of Ekstra Sterk comes in. Until then, good luck with the new snus site. 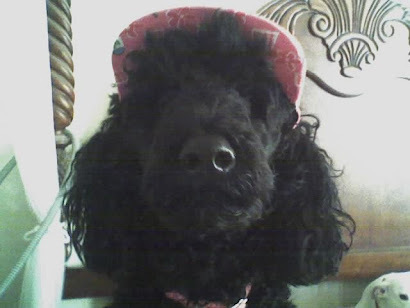 I will be checking back daily so that I do not miss the debut. Hi Anonymous Snus Guy #1! That's great news! I have, in transit as we speak, all of the new Ekstra Starks and Sterks on the market plus some 11-13 mg. Starks I haven't used in a while or used....plus a roll each of skruf stark and General Onyx: two very different tasting but my favorite current Starks to use as benchmarks. I'll be doing a total and comprehensive review of Starks and Super Starks including the General Ekstra Sterk to open the new website. I'm still biting my tongue but lets just say I have another super high nicotine snus to compare them to.....which isn't on the market yet! That's the last word on the subject. We're getting there with the new website but when you see what we built, you'll understand the time delay. It's amazing and you're going to love it! Thanks for giving me hope on the General Ekstra Sterk! My personal favorite stark is Skruf Stark. I also acquired 2 rolls of the Cuban stuff (romeo y julieta and montecristo) from a friend in Canada. These too are starks and are delicious snuses! If you can get your hands on some, I recommend it. I hope they make your list. Hey, it's been awhile since my last visit, but I had to pop in. I just received my roll of Ekstra Sterk General, and I couldn't be more pleased. It definitely delivers the kick of two regular General pouches in one (yes, I stuffed 2 at a time). I'm pleased, and I hope they don't yank it off the market. I've been hearing that a lot! I'll be doing a review on the new website of ALL the new Extra Strong Nicotine snus's: they're all sitting in my refrigerator. After finishing several can of General Ekstra Sterk, I would like to describe my views on it. The taste is best described as classic General with subtle hints of lemon and pepper; this version has tobacco flavor which is very dominant, similar to Nick & Johnny. The nicotine kick starts within five minutes and lasts for a whole hour. Everything about this snus is perfect (in my honest opinion). I ordered over twelve cans of this snus recently; I would not be surprised if this becomes the only snus that I use! I couldn't wait any longer and broke open a can of Ekstra Sterk last night. It is exactly what I was hoping the General Sterk was going to be...and wasn't. You said it so perfectly, I'm only going to say I have one regret: I only bought one can of the General Ekstra Sterk for the taste test I'll be doing of all the Extra Strong's on the new Website. My last order was a roll of skruf stark, a roll of Gotlandssnus Green (very good too) and 17 assorted cans. When this can is gone, it's going to be a while before I'll be ready to reorder. I'm REALLY going to miss the Ekstra Sterk until then.